You probably already know a bunch of open chords - most guitarists learn them early on. With these basics under your belt, your next step is to try barre chords - the idea is to move an open shape one fret higher, then use your first finger to press down across all six strings at the 1st fret. What results is an easy way to learn loads of chords. All you have to do is move the new shape up the fretboard one fret at a time. This gives you 12 chords, but you can easily learn more. Our first tab example shows five open chords: E, E7, Em, Em7 and Emaj7. Apply a barre and you have 60 chords at your disposal. In theory, this barring process works with any open chord; in practise, E, A and D shapes are most commonplace, with C and G requiring fiendish finger stretches. Follow our lesson and you’ll soon be playing hundreds of shapes. Start by slowly playing the chords in bar 1 using your second, third and fourth fingers. Now take a look at bar 3: play the same shapes one fret higher and place your first finger across the 1st fret. This changes the pitch to F - so you get five new chords. Move up another fret and you get F#, and so on. Just as before, the idea here is to take five open chords, this time based around the open A shape, then move up the neck one fret at a time. If you play a barre at the 1st fret you get A# (aka Bb); play your barre at the 2nd fret and you’ll be playing B chords. We’re hammering the idea home by applying the same process to the open D shape. Once again, use your second, third and fourth fingers for the open shape to leave your first finger free to barre across the strings. Bar 2 tells you the names of the root notes as you move up the fretboard. These three ideas show you how you can adapt the three open shapes when you play them as barre chords. 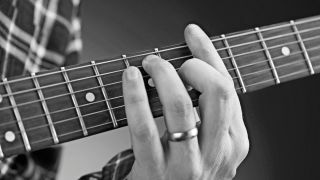 Remember, as with any barre chord, you can simply move up or down the fretboard to play the same riffs in different keys, so give it a try! Are you feeling the burn yet? Barre chords are notorious for making guitarists’ fingers ache, especially if you haven’t been playing long. It takes time to develop the strength these shapes require, so do persevere - you’ll get there eventually. Just make sure to stop if aches turn to pain. If constant barring is a struggle, why not try switching between open and barre chords? Try: E to F; Em to Fm; Amaj7 to Bbmaj7; Am7 to Bbm7. It’s really up to you, so feel free to mix up the exercises and have fun playing all across the fretboard.